legendary "A Team" and of course Doc Holiday for bringing this song to life , and giving me this memory and opportunity I'll never forget . Greetings, Doc:, I just wanted to send you a quick note to thank you for all you have done for me in helping me with my career. As you know, the CD/album you produced at The Power Plant Studios resulted in not only huge radio play around the world, but got me charted in several different countries (as well as on the Worldwide Most Played Chart!). Your direction, arrangements and song selections just were wonderful. It was such a pleasure working with you. Not only did I learn an immense amount about recording and the industry as a whole, but I had a ball doing it. I look forward to collaborating with you again in the near future. I mean, come on...Who else would I trust to produce me now??? With Best Regards, Jessica Rogers (Country Recording Artist) PS. Next time I'm in town let's do lunch again! Love that Chinese place! I wanted to take the opportunity to thank you for all the hard work you have put in towards my music and promotions. 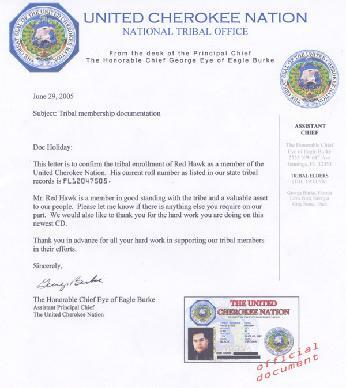 After our last CD, “The Songs Remember,” won the 2004 TELLY award for music video of the year, I didn’t think it could have gotten any better but, we went on to get a Native American Music nomination, and Independent Music Award nomination, a letter from the President of the United States thanking us for our wonderful tribute to September eleventh and most importantly several first round entries in the 47th annual GRAMMY Awards, wow what a year. Thanks again for all your hard work, dedication, and loyalty to the craft and congratulations on becoming a voting member of the Grammy’s. 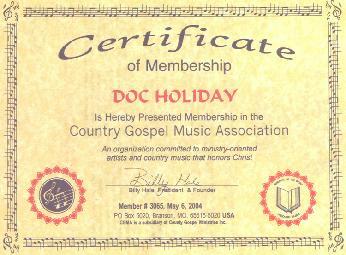 Winner 2004 "TELLY" Award for the Music Video from the CD "The Songs Remember"
Blessings to you Doc ! Thank you for all the beautiful " Musical Life Adventures & Experiences" that having you for a friend has allowed me to be a part of ! Yesterday....I believe the year was 2000. I thought I had seen and done almost it all. ! I was walking down the street with my head held high and my pockets full of dreams. And I fell into a hole. I had fallen into this hole and I had picked my self up and dusted myself off and got out of that hole many times before. This time the hole was much deeper and I didn't really care if I got out or not. Then we met and it began. You grabbed me out of that hole and dusted me off and said : Hey Man ! WAKE UP! It's not all about the business and money! You've been given the "Gift of Music"! You taught me that..... Sad is to live in solitude. Far from your tranquil attitude. Sad is to know that no one ever can live in a dream, that never will be, will never be, dreamer awake, wake up and see. Your beauty is an airplane, fly so high that can't stand the strain. My musical heart was an empty shell, then you came along , you smile, and suddenly it's spring! The sound of violins, the sound of birds high on their wings! You taught my heart to sing ! Now my hearts filled with song! The miracle of experiences with you will last my whole life through! When I think of all my musical influences, you're on top of the list! My Friend...My Counselor.........My Mentor........I think that there's a time in your life, when you realize that what ever it is that's eating you,....what ever it is that you're running from,...whatever it is that you're afraid of.......you just have to stop.....take a deep breath,.....turn around, and face it. Face it, stick your arms out wide as you can and embrace it. Hold on real tight! You see the tighter hold you hold on to it, the smaller it gets and you just embrace it and embrace it until you find yourself embracing yourself. Then you can move on with peace of mind! All that stuff, just leave it behind! ( Like the first time you told me "Go up on that stage and announce all these bands! Or........jump off of a platform 1,000 foot high on a rubber band in Gatlinburg! DO IT NOW!!!!!! OK DOC!. Sometimes you don't understand why life is the way it is. Things don't always go the way you planned them. But I believe God and time are synonymous and in time God reveals all things. You got to be still...Standing......Loving...Paying Attention. So sweet the journey when you learn to love yourself, expect yourself, forgive yourself, believe in yourself, be yourself. YEAH! THANKS DOC ! I am free of anger, I am free of fear and my mind is at ease. I don't regret a single yesterday, because yesterday made me who I am today! And today I am who I am in music because "The Doctor" healed me! He taught me to walk, and he taught me to talk He made me cry and taught me to fly! He taught my heart to sing! Keep walking in that sunshine Doc, cause wherever you go that sunshine lights up somebody's heart and It begins to sing! You never take more than you give ! 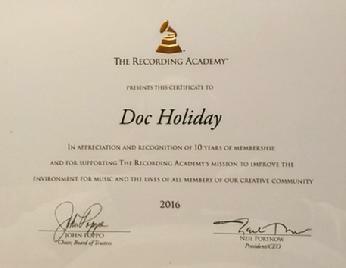 LONG LIVE DOC HOLIDAY!!!!! p.s. Oh! !...You're a pretty good producer too ! DOC, JUST A QUICK NOTE TO SAY THANKS FOR ALL THE WORK YOU DID FOR ME. WITH YOUR HELP I COVERED MORE GROUND THEN ANY ONE THOUGHT I COULD. WE MADE SOME GREAT RECORDS TOGETHER AND GOT SOME GREAT AIRPLAY. LOOKING FORWARD TO WORKING WITH YOU AGAIN SOON. Dear Doc, This is to say thanks for the great experience that my Nashville colleagues and I have had working with you over the years. In particular, our most recent collaborations have been especially noteworthy. I�ve discovered over the years that your sense of musical craftsmanship and imagination gives us the freedom to escape the �cookie cutter� mentality that so often strangles us in the record business. Also, because of your refreshing approach, I find that the best session players are always eager to play your dates. As you know, besides working on records, I am very heavily involved in scoring music for network television and feature films. Therefore I have a great appreciation for a producer who can bring a project in on time and on budget - as you have done in every instance where I have participated. I wish you much continued success and look forward to the next project we do together. It is so long since I touched base with you, I just got the CD from Johnny Napp a little while ago. The first chance I had to give a spin was the other day. I must trust your production an awful lot because I didn't pre-listen to any of them, I just put three tracks to air based on their titles. I am rapt in the CD I think this young man is excellent and well done to you on your brilliant production. You will find the songs I played on yesterday's play list that I posted on the net. Hi Doc, This letter is long overdue, but my appreciation for the time you took to have a word with me has remained constant all the while. It was reassuring to find that we were on the same page about so many aspects of the business. I can think of few people in this kind of work of whom I've heard it said that they truly deserve the reputation and success they enjoy, You are one of them! 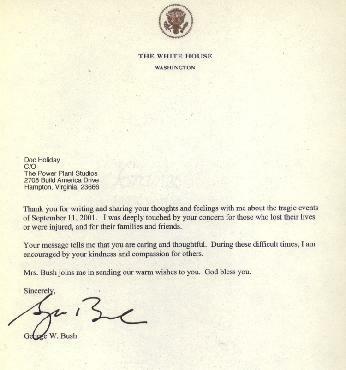 We just wanted to write to thank you for all you have done for us. Sometimes recording can become tedious and frustrating but working with you was a totally new experience for us. Your professionalism and experience really ranks among the top as producers go. You made us feel welcome, right at home and brought the very best out in us. A real pleasure to work with you and we look forward to working with you again. I want to thank you for your expertise in the production of "Goin' Down Mis'sippi." I have always wanted to record and release the original music that was inside of me. This dream could have never materialized without the 50+ years of experience you bring to a project. I was unaware of the myriad of minute details and pitfalls that this industry possesses. The conversations and face to face interactions we have had has shown me the enormous dues you have paid. The time at "Power Plant Studios" was productive and direct. I like the no nonsense, get down to business attitude that was flying through the session. I have done studio work in the past, and too much time and money is wasted when producers don't have a solid "blueprint" of the product development. The equipment at the studio is top dollar, but of no use if the technical knowledge is not there. This is not the case at the "Power Plant." Post production amazed me! The additional lines enhanced the songs I had written, but did not lose the feel that I was striving for. The sense of dynamics of you and your staff is nothing short of miraculous. The artwork captured the essence of the product, and the soul of my being. Now the business end of the Mega staff takes over. This was one of the finer, but critical, details that I was unaware of. The relationships in the industry that your organization has developed, are more than impressive. The marketing team works relentlessly in the wings, while the artists, musicians, engineers, and producers stand center stage. They truly are the unsung heroes of the finished product. Lastly, I cannot thank you enough for the peace of mind you instilled in me. The more I learn of this industry, the more anxiety and frustration I feel. But not on Doc Holiday's team!! You recognized my insecurities and anticipated my concerns. 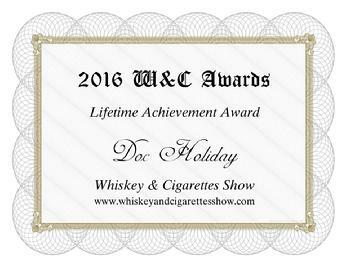 Just like a doctor treats the whole patient, Doc Holiday treats the whole artist. DOC, THANK YOU SO MUCH FOR ALL THE ENCOURAGEMENT THAT YOU OFFER, AND THANK YOU FOR SHARING THOSE SONGS OF YESTERDAY. I DO NOT HAVE TO TELL YOU THAT THE FAMILY REALLY ENJOY YOUR STORIES AND WORDS OF TRUTH AND WISDOM. WHEN YOU TALK TO YOUR MUSICAL A-TEAM, PLEASE SEND OUR REGARDS. WE ARE LOOKING FORWARD TO GETTING BACK INTO THE STUDIO, SO THAT WE CAN CONTINUE TO BRING OUT THE BEST FROM ONE OF YOUR BRIGHTEST NEW STARS. I was so excited to read that you were pleased with the track. It's just like me to walk out of the Quad door to think of 5 things that I could have done different or better. If you feel that there is a touch or two that needs a tweek,I will be more than happy to pop back into Quad and nail it down. You are an extraordinary person Doc. It is my pleasure to be your friend. Call upon me for anything you need. You are the REAL Music Man.